Regular readers of the Belt Pulley magazine will remember that Mankato, Minnesota lies at the bend in the Minnesota River Valley where the river makes an abrupt turn from flowing to the southeast and heads north to the Twin Cities of Minneapolis and St. Paul. (See the article “The Wilmar Thrun 1937 John Deere Model B (Short Frame) Tractor [Part 1: The Mankato Implement Company”] at page 16 in the March/April 2002 issue of Belt Pulley magazine.) U.S. Highway No. 22 makes its way southward out of Mankato, Minnesota up out of the Minnesota River Valley. Also as previously noted following Highway 22 south reveals a sudden topographical change in scenery. (See the article called “The Wilmar Thrun 1937 John Deere Model B (Short Frame) Tractor [Part 2]” contained in the May/June 2002 issue of Belt Pulley magazine.) Almost as though passing through a doorway, one emerges from the hilly tree-covered land of the valley and comes out onto the open prairie. The prairie is flat as a tabletop and basically treeless except for the clumps of trees that surround the building sites of the farms that dot the scenery. Out on the prairie, one can see a building site of farms in every direction, even those that are some distance away. Nine (9) miles south of Mankato, U.S. Highway 22 passes through the small-unincorporated hamlet of Beauford, Minnesota. Five (5) miles further south, the highway arches eastward around the village of Mapleton, Minnesota (1940 pop. 1070) located in southern Blue Earth County. Running directly eastward out of the center of Mapleton is Blue Earth County Road No. 21. One mile east on County Road No. 21 brought a person to the intersection with County Road 159. In 1944, one mile south on County Road No. 159 and on the right side of the road, was the farm of Carl F. and Emma (Truebenbach) Schull located on the west side of the road. Carl Fredrich Wilhem Schull, Jr. had been born in Pommern, Germany to Carl Sr., and Caroline (Papke) Schull on July 31, 1869. In 1881, when young Carl Fredrich was aged eleven years, the family which consisted of Albert, Henry, Gustav and Caroline in addition to Carl Frederich, immigrated to the United States. The family first settled in Lime Township of Blue Earth County, just west of Mankato. Carl Frederich grew up in Lime Township. As an adult, Carl struck out on his own and moved to his own farm east of Mapleton in 1899. On October 25, 1899, he married Emma Truebenbach. They began a family which would eventually consist of six children, George, Fred, Earnest, Rosine, Walter and Arno. Arno Schull, the youngest child, was born on February 26, 1917. Most of the corn, oats and hay, they raised in the fields on their 120 acre farm was fed to the herd of Holstein dairy cattle they milked, the pigs that they raised and, of course, the horses that they used in their farming operations. The older sons grew up, got married started farming operations and families of their own. Rosine, the family’s only daughter, also married and left the farm. By 1944, only 27 year old Arno was left on the farm to help his father. However, in that year life suddenly took a sharp turn for the family when Carl Frederich was struck down by a heart attack while working in the family garden on the morning of Wednesday October 11, 1944. He died almost immediately. All responsibility for running the family farming operation, then fell mainly on Arno’s shoulders. Like most sons on many family farms across the nation at this time, Arno had new ideas on how the farming operation could be improved. One of his main new ideas was the acquisition of a modern farm tractor. He knew that by mechanizing farm power rather than relying on the horses, he could save much time and effort in the farming operation. However, he was unable to purchase a tractor immediately. Under the economic restrictions in place during World War II, purchase of new farm tractors was drastically curtailed and even the used machinery market was greatly restricted. Immediately, upon V-J Day on September 1, 1945, signaling the end of the World War, economic restrictions were lifted. However, the abrupt ending of the government restrictions triggered a period of spiraling inflation through out 1946. Consequently, government price controls were re-imposed. Arno had to postpone his dream of having mechanical power on his farm. Young farmers like Arno Schull of Mapleton, Minnesota were part of the same exact demographic group that was being studied by farm tractor manufacturers. One of these tractor manufacturers was the Massey-Harris Company Ltd. of Racine, Wisconsin. Massey-Harris was rather late in getting into the tractor market. Indeed as noted in the previous article in this series, the company had tried three times to find a tractor design that would be a popular sales item with the farming community. As noted in the previous article, only in 1928, when the Massey-Harris Company acquired the rights to manufacture and sell the Wallis tractor was the company successful in entering the tractor market in a major way. The Wallis tractor was a very advanced design of tractor. The Wallis tractor was the first tractor designed with an entirely enclosed power train. This was the famous U-frame design that was first introduced on the Wallis Cub tractor in 1913. (Michael Williams, Massey-Ferguson Tractors [Blandford Press: London, 1987] p. 29.) The enclosed power train was so popular that soon all the other tractor manufacturers would copy this design for their own tractors. Nonetheless, the Massey-Harris Company realized that the design of the Challenger was really a mere modification of the same tractor design that had been developed in 1913. Thus, the design was badly out of date in the late 1930s. Consequently, Massey-Harris engineers set to work on a totally new design for a row-crop tractor. In 1938, the Company went into production with this radically new design. The tractor was called the Model 101 Junior. The power unit for the new Model 101 Junior was outsourced by Massey-Harris. The company signed a supply contract with the Continental Motors Company of Muskegan, Michigan, for purchase of sufficient numbers of Continental’s four-cylinder Model WFA “Red Seal” engines for installation into the new 101 Junior tractors that were being built at Massey’s Racine, Wisconsin, tractor manufacturing facility. Testing of the Model 101 Junior at the University of Nebraska on May 22 through May 26, 1938 revealed that the Continental-powered 101 Junior delivered 19.44 horsepower to the drawbar and 27.57 horsepower to the belt. (C.H. Wendel, Nebraska Farm Tractor Tests p. 131.) The 101 Junior was a radical departure from all previous Wallis/Massey-Harris designs. The tractor was fitted with a mechanical lift under the seat for raising the cultivator. The operator need only step on a pedal on the operator’s platform to raise and/or lower the cultivator with this mechanical lift. Battery power, a generator, electric lights, electric starter and rubber-tires were widely popular options available on the 101 Junior. Not only was the Model 101 Junior a modern row-crop tractor, but also it was “styled” in the modern fashion with extensive sheet metal covering the radiator and power train. In the late 1930s nearly every other tractor manufacturing company was exploring “styled” designs for their tractors. Industry leaders, International Harvester and John Deere did not introduce their line of “styled” tractors until 1939. Thus, the 101 Junior moved the Massey-Harris Company to the forefront of modern tractor design a year ahead of the competition. Also in 1938, Massey-Harris introduced the larger Model 101 Senior with a six-cylinder Chrysler engine. In 1942, the company also introduced the smaller Model 81 row-crop tractor. These tractors were also styled tractors. Nevertheless, the two-plow 101 Junior proved to be the most popular selling tractor in the Massey Harris line of tractors. Even with the wartime restrictions in place, Massey-Harris sold 34,668 Model 101 Junior tractors from 1938 until the end of 1945 of this number 27,371 were the row-crop version of the tractor. In 1940, the 124 cubic inch Continental engine in the Model 101 Junior was replaced by a 140 cubic inch Continental engine. In 1942, this engine was replaced by the 162 cubic inch Model MFB Continental engine. With the end of the Second World War, the huge pent-up demand for new farm tractors and farm machinery was unleashed. However, the farming public was demanding larger tractors with conveniences like hydraulic power and a wider range of speeds. In answer to this demand, the Massey-Harris Company updated the Model 101 by adding a 5th gear to the transmission of the Model 101 Junior. In 1948, the mechanical lift of the 101 Junior gave way to the new hydraulic system for lifting the cultivator. This hydraulic system consisted of a hydraulic cylinder located under the operator’s seat which would raise or lower the rockshaft to which the cultivator was attached. This hydraulic system was such a popular option with Massey-Harris farmers that Massey-Harris offered the hydraulic cylinder and appropriate linkages as a kit that could be purchased for retrofitting onto Massey-Harris tractors originally fitted only with the mechanical lift. Just like the late-model 101 Junior, the new Model 30 was fitted with a Continental “Red Seal” Model MFB 162 cubic inch engine. When tested at the University of Nebraska, the Model 30 developed 20.64 horsepower at the drawbar and 30.09 at the belt pulley. (C.H. Wendel, Nebraska Farm Tractor Tests, p. 147.) Design of the Model 30 provided for a fifth gear in the transmission. As noted above, from 1948 onwards, a new hydraulic system was integrated into the design of Model 30 tractor. Thus, the Model 30 was well adapted to the farming needs of the post-World War II economy and sales of the Model 30 reflected this fact. Another change that was made to the 1948 Model 30, was somewhat cosmetic in nature. The throttle control lever was moved from its former position on the right side of the steering column behind the steering wheel to a new position between the legs of the operator. As noted above, Massey-Harris manufactured 3,438 gasoline-fueled row-crop Model 30 tractors in 1948. These tractors were shipped from the Racine, Wisconsin factory to the network of Massey-Harris dealerships spread throughout North America. Some of these gasoline-fueled row-crop Model 30 tractors made in 1948 were shipped to the W.J. Nelson Implement dealership in Amboy Minnesota, (1940 pop. 576). The W.J. Nelson Dealership was founded in Amboy in 1919 by William J. (Bill) Nelson. Bill Nelson had been born in Vernon Center, Minnesota in 1892. Vernon Center (1940 pop. 355) is another Blue Earth County town, was located just five miles north of Amboy on U.S. Route #169. In June of 1918, a year before founding his dealership, Bill had married Frieda Deljen. Frieda was the daughter of John and Ernestine (Benzel) Deljen of rural Mapleton Township. Together they would eventually have a family of two sons, Roger and Willard Nelson, and a daughter, Glee Helen. The wartime economic restrictions placed on the nation’s manufacturing companies during the Second World War severely restricted the amount of farm machinery that the W. J. Nelson Dealership could obtain and sell to the farming public. However, once the war was over the wartime restrictions were lifted. The demand for farm machinery, which had been pent up for the nearly four years, during the United States’ involvement in the Second World War, came bursting into the market place. Anticipating the flood of new business, the W.J. Nelson Dealership moved, in 1946, from their location in the center of the business district in Amboy to the intersection of Minnesota State Route 30 and United States Route 169 on the west edge of town. In their new location, the dealership began another period of tremendous growth based on the new post-war tractors and farm machinery available from the Massey-Harris Company—particularly the new two-plow Model 30 Massey-Harris tractor. Under normal free market conditions individual farmers are faced with a two-edged sword. On the one hand they hope for a bumper crop to bring to market. On the other hand bumper crops usually result in surplus products in the market and result in low prices. Thus, a large bumper crop can be as bad as a small crop for the farmer’s economic survival. Since 1941, farmers had been encouraged to raise as much crop as they could to support the war effort. The federal government had provided a financial incentive for farmers to raise a great deal of farm commodities. (From a Columbia Encyclopedia article called “Agricultural Subsidies” (2001) found on the Internet.) By setting very high government subsidized price supports for various farm commodities, the government removed one of these problems facing individual farmers. Thus, during the war Arno Schull and his neighbors worried less about the threat of a bumper crop resulting in low prices. Instead they concentrated only on raising as much crop as they possible could and getting as much of that crop to the market as possible. When the war ended, the high price supports were left in place as the United States attempted to feed war-torn Europe, through the Marshall Plan. Thus, thanks to government price supports, farm commodity prices remained relatively high throughout 1947 and 1948. Arno Schull knew that he would be assured a relatively high price for his crops, especially corn, at harvest time if only he could get enough of the crop to market. Now if only weather would cooperate. However, in southern Blue Earth County, Minnesota, the outlook for the weather in the fall of 1946 did not look good. The rains began in the fall of 1946 and did not stop. (Regular readers of the Belt Pulley magazine will remember the effect of the rain in 1946-1947 on another family in the article called “The Case NCM Baler and a Family’s Crucial Year” in the January/February 1995 issue of Belt Pulley p. 31.) The constant rains continued into the spring and early summer of 1947. Because of the extremely wet spring and summer of 1947, spring planting that year was badly delayed. Hopes for a decent crop were rapidly fading. With the late planting, it was feared, the growing season would just not be long enough to allow the crops to mature. Fortunately, the rains eased somewhat in July of 1947, but still, there did not seem to be enough time to allow the corn to mature. As the fall progressed, Arno was pleasantly surprised to see that the harvest season remained unseasonably warm and dry. Furthermore, the drying weather continued well into the winter months. This happy circumstance allowed Arno’s corn to fully mature and allowed him to get all the corn picked and safely stored away in the corncrib. The corn not used on the farm was shelled and sold in the spring. With the income from the corn and milk from his farm, Arno made a decision to mechanize his farm. Now in the spring of 1948, Arno Schull finally felt the time was right to obtain a tractor. He visited his local his local Massey-Harris dealership—the W.J. Nelson Dealership in Amboy, Minnesota—and signed a purchase agreement for a new Massey-Harris Model 30 tractor. The purchase agreement also included a Model 34 Massey-Harris mounted cultivator with spring trip teeth. Because of the delay in the harvesting of the crops in the fall of 1948, Arno had not completed all of the fall plowing on his farm. Now in the spring of 1948 warm weather arrived sooner than usual. Even in early April, the temperatures during the day were in the high 70s. For plowing with the new tractor, Arno had purchased a McCormick-Deering Little Genius two-bottom tractor plow with 16” bottoms. The Model 30 tractor handled this plow well even in the hard black gumbo soil of Mapleton Township. Arno was pleased to note that plowing in the spring of 1948 proceeded at a much quicker pace than would have occurred had he been forced to continue farming with the horses that year. No longer did he have to stop at the end of the field each time across the filed to rest the horses. The warmer temperatures in 1948 continued throughout the spring. May 1948 was unseasonably warm as temperatures reached 90 degrees. (Minneapolis/St. Paul International Airport Daily Maximum/Minimum Temperatures for 1948 located on the Internet.) Thus, spring planting was completed early, unimpeded by the weather. The corn sprang up out of the ground in the warm weather and, soon, Arno was back in the cornfield with the Model 30 and the mounted Model 34 cultivator. For this first cultivation of the corn, Arno attached the shields to the cultivator. The shields protected tender shoots of corn from being covered up and crushed by the large clods of gumbo soil that were rolled up by the cultivator shovels. The temperatures during the month of June in 1948 were actually cooler than the temperatures had been in May with temperatures reaching no higher than the low 80s for most of the month. (Minneapolis/St. Paul International Airport Daily Maximum/Minimum Temperatures for 1948 located on the Internet.) Thus, the initial cultivating of the young corn was almost a pleasure. Nearly every day during the month of June of 1948 a short rain occurred. (Minneapolis/St. Paul International Airport Daily Rainfall Amounts for 1948 located on the Internet.) However, the rains were usually less than 2 to 3 tenths of an inch. This was just enough to keep the corn growing properly, but not enough to prevent him from doing his fieldwork. As the Model 30 and the cultivator approached the end of the field, Arno slowed the Model 30 tractor a little more with the throttle located between his legs on the operator’s platform. Then he pulled on the hydraulic control lever also located between his legs just behind the throttle. The pipes linking the front cultivator units with the rear cultivator unit which passed between the fenders of the operator’s platform on either side of the operator’s seat of the Model 30 tractor, moved forward and the shovels of the Model 34 cultivator were lifted out of the ground just before the front wheels of the tractor passed over the first of the eight (8) end rows planted at each end of the field. Arno touched the right brake to bring the front end of the tractor around to be aligned with the next two rows of uncultivated corn. Then he pushed ahead on the hydraulic control lever and the cultivator shovels were dropped into the ground and then he readjusted the throttle to a half-way position on the quadrant and the tractor headed out across the field again. The whole turn could be accomplished without even disengaging the clutch. Arno was pleasantly surprised with the progress he was making on the cultivation of the corn, cultivating two rows at a time with the tractor as opposed to cultivating only one row at a time with the horses. He appreciated the fact that he did not have to raise the cultivator by use of hand levers at the end of the rows. The cultivator was effortlessly and quickly raised by the tractors hydraulic system. Heading back across the field with the new tractor and cultivator, Arno could hear the excited calls of the Killdeers who were tending their nests, which were built directly on the ground in the corn field. He could see the adult Killdeers feigning broken wings in attempt to draw attention away from their nests which were now filled with unhatched eggs. Early July 1948 saw the return of very hot weather as the mercury climbed to temperatures in excess of 100 degrees Fahrenheit. (Minneapolis/St. Paul International Airport Daily Temperature Amounts for 1948 located on the Internet.) The unseasonably mild days of June were left behind. Furthermore, the first two weeks of July saw no rain whatsoever. (Minneapolis/St. Paul International Airport Daily Rainfall Amounts for 1948 located on the Internet.) As he cultivated his corn for the second time in July, Arno worried that the corn would be stunted in growth by the lack of water. However, as he cast his eyes over to the oat field, he could see that the oats were ripening nicely in the intense heat and dry weather. With income he had received from the milk, the pigs and sale of some of the excess corn not used as feed, Arno had revisited the Nelson Dealership to purchase a Massey Harris pull-type “Clipper” combine. (The story of this combine will be included in the next article in this series on Massey-Harris farming.) Soon he would be returning to the fields with the new combine to harvest the oats. The rains returned in late July and continued into August of 1948, just as he was attempting to harvest the oats. (Minneapolis/St. Paul International Airport Daily Rainfall Amounts for 1948 located on the Internet.) Luckily these periodic ½ inch rains did not ruin his oat crop which was lying in windrows waiting to be harvested. The thirsty corn, however, lapped up all the moisture that the rains could supply. The Massey Harris Model 30 tractor had speeded up the process of cultivation of the corn and also had allowed him to get the combining of the oats completed without damage from the rains. By the time of the large 2” rain storm which struck in mid August all the grain was safely under cover. With the oats already harvested, the corn to tall for any more cultivating and the ground too wet for any other type of field work, it was a good time for Arno to catch up on a little of his favorite hobby—fishing. After the cows had been milked in the evenings of mid-August he was able to get away in the family car to go fishing for Blue Gills at his favorite fishing spot—Cottonwood Lake, a small fishing lake located on the Landsteiner farm not far from his own farm. However, anticipating greater need for food around the world, United States farm commodity prices once again rose. (See the Columbia Encyclopedia article called “Agricultural Subsidies” cited above.) Once again farmers sought to expand and modernize their farming operations. The effects of this new demand were felt at farm equipment dealerships around the nation. After a short dip in sales in 1949, the Nelson Dealership, once again, noticed a strong demand for farm equipment starting in late 1950 spurred by the demands of the Korean War. Since October of 1949, Bill Nelson had been retired from active management of the dealership. Management of the dealership was not in the hands of Bill’s sons, Willard W. and Roger J. Nelson. Despite the re-introduction of restrictions on the manufacture of farm equipment, Willard and Roger still had less trouble obtaining farm machinery than their father had had during the Second World War. Other Massey Harris dealerships across the nation shared these experiences. One dealership in particular was the Pimper Dealership of Howells, Nebraska (1950 pop. 784). Al Pimper married Beatrice Chudomelka of rural Dodge, Nebraska. She was the daughter of Don Chudomelka who presided over a variety of activities on his farm north of Dodge. The Chudomelka farm was a busy place with a dance hall, a roller skating rink and a scale for weighing truckloads of grain. Every building on the Chudomelka farm was covered in corrugated metal. Thus, the farm became known as “Tin City.” In addition to operating the dance hall, operating an ice skating rink in the winter and doing custom weighing of grain for the neighborhood, Don and his two sons operated their own farm and also found time to do custom threshing in the neighborhood with their own Case steam engine and large Case thresher. Settling in Howells with her new husband Beatrice traded one busy situation for another as the Pimper Dealership sought to supplement the battery business and obtained the franchises to sell cars for the Ford Motor Company, the Maxwell Motor Company of Detroit Michigan and to sell the Whippet car and the Willys/Knight car for the Willys-Overland Company of Toledo, Ohio. When the Maxwell Motor Company became the Chrysler Corporation in the middle of 1925, the Pimper Dealership became a sales outlet for Chrysler cars. Later, in 1935, as the Ford Motor Company sought to build a sales network composed of exclusive dealerships, the Pimper Dealership lost their Ford franchise. In the late 1920’s probably 1929, the Pimper dealership obtained a franchise to sell farm machinery for the Oliver Farm Equipment Company. This was the Pimper Dealership’s first excursion into the farm equipment market. However, it was not until the Pimper Dealership obtained the franchise to sell Massey-Harris farm machinery in the late 1930s that the dealership really found its notch. Al Pimper was aided in the successful dealership by a number of different factors. First, his son, Al Pimper Jr., who had been born in 1923 was now of high school age. During his time out of school, Al Jr. was employed in the parts department at the dealership. Additionally, the Pimper Dealership developed a good working relationship with the Massey-Harris Branch House in Omaha, Nebraska, and with Larry Dimig, the District Manager. This favorable relationship assured the Pimper Dealership of sufficient amounts of tractors and machinery to keep its inventory full at all times. At times the dealership ordered six or seven railroad carloads of machinery at one time from the Branch House. Just like the W.J. Nelson Dealership, the Pimper Dealership experienced ups and downs in sales in the post World War II era. In 1951, with high prices for farm commodities fueled by the Korean War, the Pimper Dealership was once again selling Massey-Harris tractors and farm equipment. One of the 4,118 Model 30 tractors manufactured by the Massey-Harris Company in 1951 was the Model 30 bearing the Serial No. 15095. Number 15095 was shipped from the tractor factory at Racine, Wisconsin, to the Branch House in Omaha, Nebraska. Larry Dimig placed No. 15095 on a trainload of machinery destined for the Pimper Dealership. Accordingly, No. 15095 arrived in Howells, Nebraska, in the early spring of 1951, on board a Chicago and Northwestern Railroad flatcar with some other Massey Harris farm equipment sent from the Branch House in Omaha. The tractor did not spend long in the inventory of the Pimper Dealership before it was sold to Joe Vogel, a local farmer in rural Howells. Joe and Catherine (Becker) Vogel operated a 40-acre farm near Howell’s Nebraska, the family of Joe Vogel, was raising pigs, milk cows and some chickens. Most of the arable land of the farm was used to produce corn and alfalfa which was used to feed the animals on the farm. By 1951 their son, Gilbert had married Marilyn Molacek and had started taking over the farming operations from his father. The family already had a John Deere Model B with a tractor plow and a mounted two-row cultivator. Thus, when the Massey-Harris Model 30 was purchased the purchase contract did not include a tractor plow or a cultivator as might have been expected. Joe Vogel appreciated the fact that the tractor was fitted with hydraulics and purchased a Duncon hydraulic loader to mount on the Model 30. The Model 30 tractor functioned well on the Schull farm in 1948 and during the following years. It was the sole tractor on the farm until 1956 when Arno purchased a new Massey-Harris Model 333 tractor. Although a row crop tractor, this particular Model 333 was fitted with an adjustable wide front end and had the optional three-point hitch. These two features would keep the Model 333 a useful part of the farming operations through the 1970s. Indeed, the present author used the Model 333 to cultivate corn with a six-row rear mounted cultivator on the Arno Schull farm the in summer of 1970. Meanwhile, the Model 30 continued as a second tractor on the farm. When the tractor became so worn out, in the early 1960s, that it needed major work done to it, Arno and his oldest son, James, purchased another Model 30 from a junkyard and combined the two tractors to make a single tractor. The restored Model 30 continued on the Schull farm for many more years. Likewise, No. 15095 continued working on the Vogel farm. Frequent use of the Duncon loader on No. 15095 created pressure on the front wheels of the tractor and required the Vogels to replace the wheel bearings and other parts on the front end of the tractor. However, this was the extent of the major repairs that No. 15095 required during its working life. In 1982, No. 15095 was sold to John Mlnarik. (John Mlnarik is the father of Glen Mlnarik who has long served as a national board director of the International Harvester Collectors Association.) John Mlnarik had operated an International Harvester dealership in Howells, Nebraska and now lived in retirement in nearby Dodge, Nebraska. In 1992, John Mlnarik advertised No. 15095 for sale and the tractor was purchased by Fred Hanks of LeRoy, Minnesota. No. 15095 was fully restored and painted in the summer of 2003 in anticipation of the August 26-29, 2004 Le Sueur County Pioneer Power Show. As previously noted the 2004 Pioneer Power Show will host the national summer convention of the Massey-Harris Collectors. No. 15095 will be present along with many other Massey-Harris tractors and farm machinery. Just as the restored No. 15095 stirs memories of other Model 30 tractors which have played a part in North American agriculture, so too will the other Massey-Harris farm equipment surely stir memories of the past with the many attendees at the Show. For a trip down memory lane be sure to be there and reminisce. Arriving at the end of this wave of German immigration in 1856 was a 36-year old young man, William Frederich Oltrogge (known as Frederick or Fred), and his 34-year old wife, Sophia. Together with their two daughters, Sophia ages 6 years and Caroline age 2, they had boarded a ship for the United States. The Oltrogge family had been originally from Hessen, or the State of Hess, in the west central part of Germany near the large city of Frankfort. The Rhine River formed the western boundary between Hess and the Prussian Province of Rhineland. The Kingdom of Bavaria which lay to the south of the State of Hess. The reasons that Frederick and Sophia brought their family to this country are not known. However, some clues might be found in the facts surrounding the immigration of the Oltrogge family. The fact that the Oltrogge family came to the United States with a group of people they had known in the State of Hess and the fact that immediately upon their arrival, in 1856, they establishing a Lutheran congregation and then a year later in 1857, they erected the St. John’s Maxfield Lutheran Church, suggests that there may have been a religious motive in their immigration to Iowa. During this period of time Germany was not yet a unified nation. Instead the German speaking lands were divided into a patchwork of small kingdoms and princely states. These small states were constantly warring against each other for one reason or another. However, Martin Luther and the Reformation of 1520 and the Thirty Years War (1618-1648) had the effect of further splitting the German states along religious lines. The states of the northern part of Germany became predominately Protestant (Lutheran), while the southern states remained Roman Catholic in religious persuasion. Whatever the reason, Frederick and Sophia Oltrogge moved with their family onto a 240-acre piece of land in Section 1 of Jefferson Township in Bremer County Iowa. The early years of settlement were mostly taken up with building the house and barn and, as noted above, the neighborhood church in adjacent Maxfield Township. It was hard work, settling in the new land. However, they were not alone. The whole neighborhood was involved in the same struggle to tame the land and carve out a niche for themselves on the prairie. In 1856, Iowa was still a frontier state having entered the union only 1846. (Leland L. Sage, A History of Iowa [Iowa State University Press: Ames, 1974] p. 91.) Large portions of the state were still inhabited by bands of Dakota (Sioux) people. Indeed, one year after the arrival of the Oltrogge family, 1857, saw the uprising of the Wahpeton Sioux against the increasing flood of white settlers that were coming into Iowa. This uprising has become known as the Massacre of Spirit Lake. (Ibid., p, 107-108.) However, the settlers kept coming even after the uprising. The town of Jefferson City (now called Denver, Iowa) sprang up three miles to the south of Oltrogge farm. By 1875, the Jefferson township schoolhouse had been built in the center of Section 2 just one mile west of the Oltrogge farm. Slowly, the community was growing. The size of the Oltrogge family also grew with the addition of a third daughter Anna Justine Wilhelmine born on April 4, 1858, another daughter Anna born on April 12, 1861 and a son William Frederick born on October 2, 1863. Named for his father, the younger William Frederick was called William to distinguish him from his father who was called Fred or Frederick. Like his older sisters, Sofia, Caroline and Anna just two years before, William, too, was confirmed in the St. Johns Maxfield Church in 1877. The community continued to make progress. A public road was eventually built directly though the center of Section 1 and 2 of Jefferson County which passed just south of the Oltrogge farmstead. The 240-acre Oltrogge farm consisted of 160 acres located north of this road and 80 acres located south of the road. Some time prior to 1875 another house was built on the 80 acres located south of the road. As William grew up, he developed a real interest in the family farming operation. The farm contained a dairy operation, with about 30 head of Holstein cattle being milked at any one time. The family also raised about 200 to 300 pigs and 500 chickens. Approximately half of their arable land was planted in corn. Since they did not have a silo on their farm, they built a bunker for storing corn silage. A portion of their corn was harvested as green corn silage; the remainder of the corn was harvested when ripe. Much of the ripe corn was stored on the farm and fed to the pigs, chickens and dairy cattle. On October 12, 1887, just ten (10) days after his 24th birthday, William married Anna Steege, an 18-year old girl from a neighboring farm. Eventually they had a family that included Louis Wilhelm Johann Heinrich born on June 1, 1890, Amanda born in 1891, John born in 1892, Herman Heinrich Friedrich William born on May 23, 1893 and Hilda born on April 8, 1895. Gradually, William took over the operations of the family farm from his father. Under William Oltrogge’s management several improvements were made to the farming operation. In the summer of 1897, he negotiated with the Borden & Selleck Co. of Chicago, Illinois for the purchase of a Howe Scale Company weighing scale for installation in the granary on the farm. A letter dated July 30, 1897 from the company headquarters located at 48 and 50 Lake Street in Chicago and signed by H. Borden, president of the company informed William that although building plans for the scale could be forwarded immediately, actual construction of the scales would be delayed until October. When installed in the covered alleyway of the granary, the 8ft. by 14 ft. platform of the scale had the ability to weigh an entire wagon load of grain or ear corn. In 1916, a new barn was built specifically to house the teams of horses that the large farming operation required. This horse barn was built as a separate building rather than being attached to the main cow barn. Some time during the First World War, William mechanized the milking of the dairy herd. He built an engine house which was attached to the granary located about fifty (50) feet away from the barn. In the engine house was a 2 ½ horsepower Fairbanks-Morris stationary engine. This kerosene-powered “hit and miss” engine was belted to a vacuum pump which, in turn, was connected to an underground pipe that ran to the barn. The Fairbanks engine was started at the beginning of morning and evening milking and supplied the vacuum necessary to power the Universal-Coop milkers which William now used to milk his herd of cows. Changes were also happening in the family. The year 1913 saw the passing of William’s father, Frederick Oltrogge at the age of 83 years. On March 18, 1914, Louis Oltrogge, William’s oldest son, married Hilda Kohagen from the local community. Following their marriage they struck out on their own and purchased a 240 acre farm which was adjacent to the original Oltrogge farm on the northwest corner of the home farm. In the summer of 1915, the Oltrogge family purchased their first automobile—a 1911 Model Kissel. Besides being a convenience for the family members the car greatly shortened the amount of time that it took to deliver the separated cream to the Co-operative Creamery in Artesian, the little unincorporated settlement located ½ a mile to the east of the home farm. Additionally, young Herman began to take up the decision-making authority with regard to the farming operation as William now in his 50’s began to think about retiring. On May 3, 1917 Herman married Millie Kohagen, a sister of Hilda. To make room for the new family on the main farm, William tore down the old house located south of the road and built a new house on that site. William, then, moved into this new house and left the main house on the north side of the road for Herman and Millie. Like his father, Herman was always seeking ways in which to improve the farming operation. Indeed, Herman was even more inclined toward this idea of modernizing the farm. In 1920, Herman, remodeled the house on the main farm. In the early 1920s, the Interstate Power Company stretched an electric power line along the road between Olewyn, Iowa and Waverly, Iowa. The power line followed the path of the road that would become State Route #3 along the edge of Readlyn, Iowa, and passing the Oltrogge farm. Interstate offered farm owners along the path of the power line the right to hook up to the power line at an affordable price. The Oltrogges accepted the offer from Interstate and electrified their farm. Now with electricity in the barn, the family hooked the vacuum lines which extended to all the stanchions in the barn to an electrically powered vacuum pump located in the barn itself. No longer was there a need for the vacuum lines extending underground to the barn all the way from the engine house. However, Herman Oltrogge was aware that the most significant improvement in farming was the farm tractor which could fully mechanize the power on the farm. Indeed, in the winter of 1917-1918, Herman’s brother, Louis, had purchased a new Model 15-25 Lauson tractor. Herman had seen, first-hand how the steady power of the Lauson tractor compared favorably to the use of animal power for performing heavy farm work. Consequently, by the Spring of 1920, Herman had purchased a 1919 Model International Harvester Titan 10-20 Model tractor. This tractor was one of the post-1919 Titans which had the full length fenders which covered both rear wheels down to the drawbar. Herman used the Titan and a three-bottom John Deere Model No. 5 plow, to do his spring plowing in 1920. The Titan was not only intended for all the heavy work around the farm, but was also intended to supply power to the belt. In 1920, the, Oltrogge’s also purchased a Sprout-Waldron feed grinder/burr mill. (Keith Oltrogge, William’s great –grandson, is a Certified Public Accountant, practicing in nearby, Denver, Iowa, still owns and lives on the family farm and still has this 1920 Sprout-Waldron burr mill on the farm.) Herman thought that the burr mill and the belt power provided by the Titan would speed up the processing of the animal feed on the farm. Although the Titan was Herman’s first tractor, he never talked about it much. It may well have been that he was dissatisfied with the Titan tractor. It is not hard to find reasons for dissatisfaction with the Titan. Regular readers of the Belt Pulley will remember a 1920 Model Titan tractor was purchased in 1927 by Clarence Rodning of St. Peter, Minnesota to mechanize his farming operation. (See the article “Farming with an International 10-20 Titan” in the May/June 1996 issue of Belt Pulley magazine, p. 16.) Among the other problems, the Titan was hard to start. Indeed, Lee Klancher in his short book on International Harvester Farmall devotes five pictures to the Titan and the process involved in starting the Titan. (Lee Klancher, Farmall Tractors [Motorbooks, Intl. Pub. : Osceola, Wisc., 1995] pp. 17 through 24.) Additionally, due to the fact that the Titan was a two-cylinder tractor with both cylinders connected in parallel to the crankshaft, the pistons moved forward and back in the sleeves together rather than in an alternating two-cylinder pattern like John Deere tractors. Thus, even though the pistons were counter-weighted to reduce vibration in the tractor, the Titan had a tendency to “lope” or rock back and forth when powering a belt driven machine. This loping on the part of the tractor sent waves down through the belt and causing the burr mill to shake in time to the waves on the belt. Herman discovered this shortcoming of the Titan when he used the tractor on the belt to power the new Sprout-Waldron burr mill he had purchased. Herman was dissatisfied with the Titan and in 1923, he traded the Titan in to the dealership of Coddington and Laird in Waverly, Iowa, (pop. 600) toward the purchase of new four-cylinder Wallis Model OK tractor. The Model OK had only been introduced in 1922 by the J.I. Case PlowCompany. (C.H. Wendel, 150 Years of Case [Crestline Pub. : Osceola, Wisc., 1991] p. 18.) The J.I. Case Plow Company of Racine Wisconsin should not be confused with the J.I. Case Threshing Machine Company which was also located in Racine, Wisconsin. The Case Threshing Machine Company was maker of the Case tractor. Although founded by the same people as the Threshing Company, the J.I. Case Plow Company had always been a separate corporate entity. In 1919, J.I. Case Plow Company was merged with the Wallis Tractor Company of Cleveland, Ohio and, thus, Henry M. Wallis became the new president of the company which bore the name J.I. Case Plow Company. Inevitably, once the J.I. Case Plow Company was controlled by persons no longer associated with the Threshing Company, disputes arose over the use of the name “Case” by the Plow Company. A decision by the Wisconsin Supreme Court allowed both companies to use the name “Case” under limited conditions. (Ibid., p. 17.) By the time the that the decision of the Wisconsin Supreme Court was handed down, the Case Plow Company had already been purchased by the Massey-Harris Company of Ontario, Canada. Immediately, after the Court decision, Case Threshing Company began pursuing a course of negotiations with Massey Harris to purchase the Case Plow Company for itself. However, Massey Harris had been trying to enter the tractor market without real success, since 1912. The purchase of the Case Plow Company represented the company’s third attempt to add a tractor to the line of Massey-Harris farm equipment. (Michael Williams, Massey-Ferguson Tractors [Farming Press: Ipswich, U.K., 1987] pp. 15 through 44.) Once having obtained ownership rights to the manufacture of the popular Wallis tractor and the large Racine, Wisconsin tractor factory, Massey-Harris was not inclined to sell this valuable property. What they were willing to sell, and what the Case Threshing Company really wanted, was the limited right to the use of the name “Case” currently held by Massey Harris as the owner of the Case Plow Company. Thus, shortly after spending $1.3 million in cash and guaranteeing another $1.1 million in bonds in order to purchase the Case Plow Company, Massey Harris was able to recoup a great deal of the purchase price by selling their rights to the limited use of the name “Case” for $700.000.00. At 4,020 pounds, Herman’s new 1923 Wallis Model OK tractor was much lighter than the 5,708 pound Titan. (C. H. Wendel, Nebraska Farm Tractor Tests [Crestline Pub. : Osceola, Wisc., 1993] pp. 19 and 42.) Furthermore, the Wallis Model OK tractor was a four-cylinder tractor delivering smooth power to the belt and to the rear wheels. Testing of the tractor at the University of Nebraska had shown that the tractor delivered 18.15 hp. to the drawbar and 27.13 hp. to the belt pulley. (Ibid., p. 42.) The Wallis tractor introduced many innovations to the tractor industry. Furthermore, by its acquisition of the J.I. Case Plow Company, the Canada-based Massey-Harris Company instantly obtained a retail tractor sales network throughout the United States. In northeastern Iowa, this meant that Massey-Harris obtained the excellent services of the Coddington and Laird dealership of Waverly, Iowa, with branch dealerships in Plainfield, Readlyn, Tripoli and Janesville, Iowa. Founded in Waverly, the Coddington and Laird dealership was the brainchild of Alva Bush Coddington. Alva (nicknamed Al) Coddington had been born in 1870 in Janesville, Iowa, located in southern Bremer County (pop. 445). After having attended business school in Burlington, Iowa, Al was employed for a while as a bookkeeper at the firm of J.C. Garner in Waverly, Iowa. Garner’s was a local business which owned a meat marketing business and farm equipment dealership holding retail sales franchises from many different farm equipment manufacturing companies, including Emerson Manufacturing Co., John Deere and Oliver plows, Ohio Cultivator Company discs and cultivators, Hayes Pump and Planter Company planters, Dain Manufacturing Company hay rakes and hay loaders, Sandwich Manufacturing Company “Clean Sweep” hay loaders, DeLaval cream separatorsand Great Western Company manure spreaders. Garner’s also had franchises to sell horse-drawn buggies made by the Staver Carriage Company of Chicago, Illinois; the Northwestern Furniture Company of Milwaukee, Wisconsin and the Velie Carriage Company of Moline, Illinois. Al Coddington was a recognized success at bookkeeping during his employment at Garner’s. In 1891, he married Olive Wetherell, a girl from his own hometown of Janesville, Iowa. Their first child, Harry Coddington, was born in 1895, but tragically died in infancy that same year. However, they eventually had a family that was to include three additional children—Herbert Wetherell Coddington born in 1896, Olive Harriet Coddington born in 1902 and Margaret A. Coddington born in 1908. After some years at Garner’s Al sought to advance his career by accepting a position in Des Moines, Iowa. However, when he heard in 1902, that his old employer—the Garner dealership firm—was up for sale, it did not take him long to makeup his mind to move back to Bremer County and to purchase the Garner dealership. However, Al felt himself unable to make the purchase of all the stock in Garner’s by himself. So he formed a partnership with Ralph Eldon Laird to make the purchase. Thus, the October 30, 1902 issue of the Bremer County Independent was able to report to its readers the first news of the consummated sale of Garner’s to the partnership of Al Coddington and Eldon Laird, which would take effect on January 1, 1903. For a place of business, the new partnership of Coddington and Laird, purchased a local icehouse and the five (5) acre lot on which it sat, located at 20 and 22 West Bremer Street in Waverly from the s of land from the firm of Miller and Babcock. A combination of good business sense on the part of Al Coddington and his partner and the beginnings of the mass demand for automobiles on the part of the public, made the new partnership a success from the very start. In 1902, the Northwestern Furniture Company, one of the companies that supplied horse-drawn buggies to Coddington and Laird, began offering a motorized “high wheeler” horseless carriage to the public. In 1907, the Staver Carriage Company did the same and in 1909, the Velie Company followed suit. Holding franchises to all three of these companies, Coddington and Laird, was perfectly placed to take full advantage of the coming boom in demand for automobiles. In the meantime, Coddington and Laird sought to broaden their line of products they could offer to the public. The partnership purchased a windmill retailer, the John Voorman retail business on February 18, 1904. At the same time, Coddington and Laird leased the old skating rink from O. Wheeler, that had been used as a place of business by John Voorman. In this building the partnership established a buggy and farm machinery warehouse. By March of 1904, Coddington and Laird was doing so well that they established a branch dealership in the small village of Readlyn, Iowa (pop. 468) located 15 miles to the east of Waverly and about six miles east of the Oltrogge farm. Al Coddington also had the privilege of opening a branch of his expanding business in his own hometown of Janesville, Iowa. By 1913, he would have additional branches in the Bremer County towns of Plainfield and Tripoli. In this way, the partnership covered every major sales market in Bremer County. The partnership attempted to find the enterprises that would best position the partnership for the future. Accordingly, Coddington and Laird sold off the meat market part of their business on May 14, 1904 to O.O. McCaffree. In November of 1904, the dealership leased the Smalley Grain Elevator located on the Chicago, Rock Island and Pacific Railroad (“the Rock Island Line”) tracks which led out of Waverly in a southwesterly direction. By 1905, Coddington and Laird was already being referred to as Waverly’s “leading farm implement house” (the October 5, 1905 issue of the Waverly Democrat). Furthermore, the October 5, 1905 issue of the Waverly Democrat, reported that in addition to managing both the implement dealership and the grain elevator, the Coddington and Laird partnership occupied four warehouses with a wide range of goods for sale including lime, coal, ice and farm implements. In March of 1910, Coddington and Laird took over the building next door to them at 16 and 18 West Bremer Street. This building was remodeled to function as a garage where the dealership would begin to offer mechanical servicing to the owners of the new automobiles, motorized trucks and farm tractors that were beginning to make there appearance in Bremer County. Two years later, Coddington and Laird was already looking for new and larger premises for their business. The May 30 and June 27, 1912 issues of the Bremer County Independent the description of the new building at the corner of West Bremer and 2nd Street North West that the J.M. Miller Construction Company had been contracted to build for the Coddington and Laird dealership. By October, the building structure was complete up to the second story. By January of 1913, Coddington and Laird was moving into their new building located two blocks down West Bremer Street from their former location. The dealership recognized that the trend of the future lie with modern farm equipment. Accordingly, Coddington and Laird sold off the ice business part of their combined enterprise to C. R. Farnham in November of 1914. Next spring, in May of 1915, they sold off the grain elevator and the coal business to the Colburn Bros. Concentrating on their core business as a farm equipment, tractor and automobile dealership, Coddington and Laird had found their niche. However, the most important franchise that Coddington and Laird obtained was the franchise to sell Chevrolet cars. In the period just after the First World War, Chevrolet was on its way toward overtaking Ford Motor Company in production and sale of automobiles—an event which would occur in 1927. (Robert Lacy, Ford: The Men and the Machine [Little Brown &Co. Pub. : Boston, 1986] p. 298.) Coddington and Laird were doing their part to help Chevrolet in this endeavor. Sales of Chevrolet cars in the twelve-month fiscal year from 1923-1924 resulted in Coddington and Laird becoming a member of the Chevrolet Division’s “Winners Class” of dealers for the year 1924. Coddington and Laird served as the local retail sales agent for many different farm equipment manufacturers. Generally, these manufacturers did not have tractors in the line of farm equipment and they often specialized in the farm machinery they did manufacture rather than offering an entire line of farm implements. Thus, these manufacturers were called “short line” companies. Only by obtaining multiple franchises from many specialized short line manufactures, could Coddington and Laird offer to the public a “complete” line of farm equipment. The Wallis tractor formed the capstone of that complete line of farm equipment offered by Coddington and Laird. In June of 1926, the dealership partitioned off the front part of their new building to form a showroom which allowed the Coddington and Laird dealership to exhibit the Wallis tractor and other farm implements, inside, out of the weather and elements, even during the coldest of Iowa winters. Although somewhat more expensive than other tractors which were on the market in the post World War I period, the Wallis tractor nonetheless, proved to be a popular sales item in Bremer County. Thus, when Massey-Harris purchased the exclusive rights to build Wallis tractors, it only made common business sense for Coddington and Laird to become a Massey-Harris franchisee, which they did in 1928. Herman Oltrogge was well satisfied with the Wallis tractor. Not only did he use the Wallis Model OK on all the heavy duty field work, but he also immediately started using the tractor on all sorts of lighter duty work around the farm. For example, he shortened the hitch on his John Deere grain binder and fixed the tractor with a long steering wheel extension that allowed him to steer the Wallis from the seat of the binder. This allowed the grain binding operations on the farm to remain a “one-man” operation just as it had been with the horses. The Wallis four-cylinder valve-in-head engine provided smooth power to the belt when Herman belted the Wallis to the Sprout Waldron burr mill. Only one problem arose on the farm because of the new tractor. The new Wallis Model OK tractor had a rated engine speed of 1000 rpm. (C.H. Wendel, Nebraska Tractor Tests [Motorbooks Intl. Pub., 1993] p. 42.) This speed compared with an engine speed of 575 rpm. for the Titan. (Ibid. p. 19.) As noted above, when he purchased the burr mill, Herman had, of course, intended to use the Titan tractor to power the burr mill. Thus, the burr mill was fitted with a 6” belt pulley with a 6” face. This small pulley had the effect of speeding up the implement. Thus, the burr mill had been customized to the slower belt speed of the Titan tractor. Herman found that the Wallis tractor powered the burr mill at too fast a rate for efficient operation. Thus, it is not surprising that on February 5, 1923, Herman wrote to the Sprout Waldron Company in Muncy, Pennsylvania to determine how to adjust his burr mill to fit the new higher speed Wallis tractor. Charles Waldron, Vice president of the company responded three days later with a suggestion that the burr mill should be fitted with a larger 8” pulley. Sprout and Waldron had an 8” pulley with a 6” leather face available for sale at a price of $5.25. Acquisition of this new pulley allowed the Wallis Model OK tractor to efficiently power the burr mill and the smooth four cylinder engine did not cause the tractor to lope and send waves down the belt. As was noted in an earlier article, during the years 1931 through 1933, the Oltrogge farm served as the test ground for the prototype of the Rosenthal corn picker. (See the article “The Rosenthal Corn Husker Company of Milwaukee, Wisconsin, Part V” contained in January/February 2002 issue of Belt Pulley magazine p. 12.) Also as related in that article, Herman traded the Wallis Model OK tractor to the Coddington and Laird dealership in 1932 on the purchase of a new Massey-Harris Model 25. Herman Oltrogge surely did not realize that his purchase of this tractor was to start a connection between the Oltrogge family and Massey-Harris tractors which extends down to the present day. The Massey Harris 25 continued to serve on the Oltrogge farm until after the Second World War. The purchase of the Massey Harris Model 25 tractor did not, however, provide the family with a tractor that would perform all farm operations. The Massey-Harris was not a “row crop” tractor that would allow for the mechanical cultivation of corn and other row crops. The Oltrogge family raised a lot of corn but even after the purchase of the Massey-Harris Model 25, they still used horses for the cultivation of row crops—one row at a time. Not until early 1942, when they purchased one of the first Case Model VAC that came out in production, did they have a row-crop tractor which would allow for the mechanical cultivation of corn and other rows crops—two rows at a time. However, after only one year with the VAC, the Oltrogges traded the little Case in on the purchase of another row crop tractor. Once again they chose a Massey-Harris tractor. They purchased a Model 101 Super from their local dealership—Coddington and Laird. The 101 Super was an important part of the Massey-Harris Company’s attempt to develop a row crop tractor. However, development of Massey-Harris row-crop tractors would come to full fruition only in the post-World War II sales boom. This story remains as a subject for the next installment on Massey-Harris farming. The connection between the Oltrogge family and Massey-Harris tractors continued. Herman’s son, Orville Oltrogge took over the farming operations from his father in the late 1940’s. The family farmed with a Model 44, a Model and a Model Massey-Harris tractors. Currently, Orville’s son, Keith Oltrogge, lives in the same house and on the same farm that was occupied by four prior generations of Oltrogges. Although, Keith works in nearby Denver, Iowa, as a Tax consultant and accountant, Keith is known to Massey-Harris collectors and restorers, nationwide, as the editor of Wild Harvest, the official newsletter for Massey-Harris collectors. In this way, Keith continues his family’s connection with Massey-Harris and actually makes the Oltrogge name as household term among Massey-Harris collectors. Massey-Harris farming will be celebrated at the 2004 LeSueur Pioneer Power Show held on August 27, 28 and 29, 2004 as the national Massey Harris collectors “Wild Harvest” summer convention will be hosted at the Show. Show attendees can be certain that Keith Oltrogge will be there to maintain his family’s continuing connection with the Massey-Harris name. Fred J. Hanks, on the left, and his father, Howard B. Hanks, clown a bit as they take the rebuilt engine block for the Massey-Harris model 44 tractor from the car to garage/workshop. The engine block has been uptown during this second overhaul of the 44 in the winter of 1960-1961 to be bored out to support larger pistons and sleeves to bring the displacement of the engine up to 288 cubic inches. My uncle, Fred J. Hanks farms in southern Minnesota. He has restored numerous tractors. Three of these restoration projects, a John Deere 620, a John Deere 630 and a John Deere model H were referred to in a magazine article he wrote for Green Magazine (Volume 9, No. , January, 1993, page 27.). Another restoration project, a Massey-Harris 30 will be featured iin an upcoming issue of Wild Harvest. Additionally, another project a 1950 Massey-Harris 22 was featured on the cover of a recent Minnesota Edition of Fastline magazine, (Volume 6, Issue 7, February 1993). The Massey-Harris 22 was one of two Masseys that used to share work with a John Deere model D on the Hanks farm from 1951 until 1966. The other Massey, besides the model 22 was a 1951 Massey-Harris 44 which is pictured herein. I have fond memories of the the 44 from my childhood. However, as this article will relate, my youth removed me from the harsh realities of the situation. The following information was provided by me Uncle Fred and gathered in conversations in August 1992 and April of 1993. Looking west inside the garage/workshop we see Fred J. Hanks standing on the right overlooking the empty frame of the Massey-Harris 44. The hood, gas tank, radiator, engine etc. of the tractor have all been removed. Howard B. Hanks stands at the work bench on the left. Straight ahead is the wood stove which is no doubt been loaded with wood and is burning with a nice robust fire on this cold winter’s day in the winter of 1960-1961. 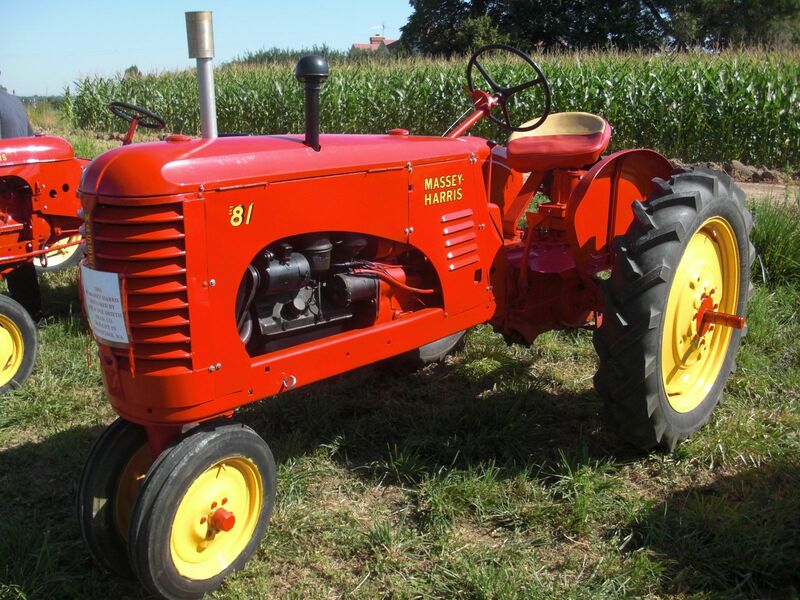 The Massey-Harris 44 was selected after a comparison with similar row-crop tractors available from any of the five (5) tractor dealerships doing business in the small town of Leroy, Minnesota in 1951 (1950 pop. 730). The Seese and Oksanen Implement dealership sold International Harvester Farmall tractors, the Farmers Co-operative operated the John Deere dealership, the Regan Ford car dealership also sold Ford tractors, the LeRoy Equipment Company owned by the partnership of Merle Krinke and Duane Wetter sold Case tractor, and by 1951 Stub Orke had left the Regan Ford dealership to establish a new Massey-Harris dealership. The Massey Harris 44 had the highest horsepower rating at the PTO shaft of any the other comparable tractors from the other four dealerships in town. This is established in C. H. Wendel’s Nebraska Tractor Tests (1985) which shows that the Massey Harris model 44 delivered 40 hp. to the PTO shaft (Nebraska Test 389 ); while the Case model DC delivered 32.94 hp. to the PTO shaft (Nebraska Tests 340); the Farmall model M delivered 33.46 hp. to the PTO shaft (Nebraska Test 328 ); and the John Deere model A delivered 33.82 hp. to the PTO shaft (Nebraska Test 384]).